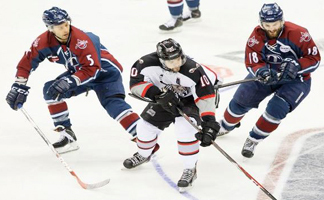 TULSA, OK—The Tulsa Oilers defeated the Brampton Beast 4-2 in front of 10,794 in the BOK Center on Friday night, their largest crowd of the season and one of the largest since the team moved from the Cox Business Center in 2008. Kyle O’Kane began the scoring for Tulsa when he skated in on Brampton goaltender Grant Rollheiser and slipped the puck in between the goalie and the post to give the Oilers a 1-0 advantage just past the midway point in the first period. The Oilers one goal advantage held until the two minute point of the second period when Brampton forward David Ling scored on the power play, snapping a shot behind Oilers goalie Brandon Anderson to knot the game 1-1. Adam Pleskach gave the lead back to Tulsa when he sent a wrist shot past Rollheiser to score his 25th goal of the season and put the Oilers ahead 2-1 headed into the game’s final 20 minutes. Brampton got back to even when Tyson Fawcett buried a David Ling pass behind Anderson a little over two minutes into the third period to tie the game at two. Then, a little over a minute later, on the power play Dave Pszenyczny slammed home a one-timer fed by Jon Booras to nudge the lead back to the Oilers, and an empty net goal by Booras sealed the 4-2 victory for the home team. Brampton finished with a 35-32 edge in total shots on goal but Anderson routinely came up with stellar stops to earn his second win in as many nights. The Oilers, 7-0-0 all-time on home ice against the Beast, moved into a tie for second place in the Central Division. 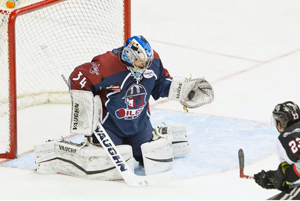 Tulsa held its opponent to two goals or fewer for just the fifth time in the last 18 games while the Beast remained winless while trailing after two periods. The win lifts the Oilers to their 20th win of the 2014-15 season and their record to 20-19-4 on the season and into a tie with the Wichita Thunder for second place in the ECHL Central Division with 46 points. Booras finished the game with three points (1 goal, 2 assists), and a 33-save performance by Tulsa goaltender, Brandon Anderson. The Oilers swept a two-game set from the Beast and improved to 4-0-0 in the season series and 8-2-0 all time. The Oilers will be back in action next Thursday at 7:05pm in the BOK Center when the take on the Rapid City Rush. This entry was posted in Sports on February 1, 2015 by admin.